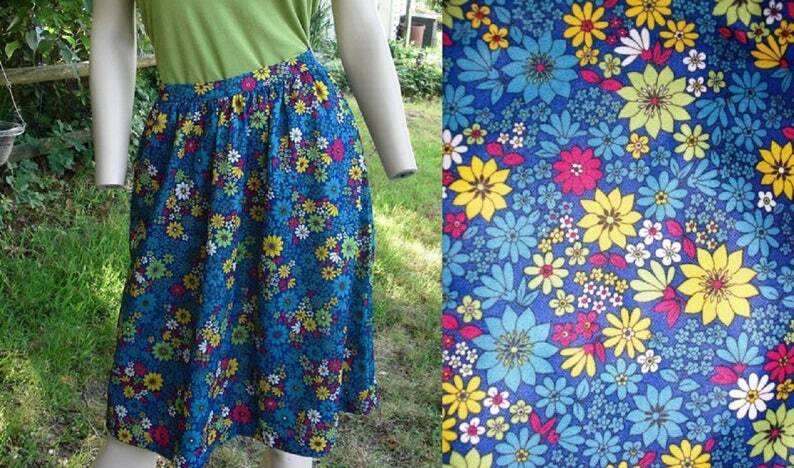 Very cute daisy print 70s skirt in turquoise, blue, yellow, hot pink, green and white. Vintage skirt has welt pockets at the hips. Great for a 70s costume and adorable addition to a funky, fun boho wardrobe. Think of the great shoe options you can wear with this adorable mod skirt! Fabric feels like a light weight knit that is not stretchy. I would machine wash on delicate. http://www.overstock.com/sizing.html Please measure yourself prior to making a purchase. Women make sure you measure your bust across the largest area. garment that you own for best fit. Wonderful quality and fast shipping! Today the down coat finally arrived. And what a beauty! The shade of gray is even better in real life, it is a bit darker and a bit shiny, like brushed steel. I was so nervous about the fit of the coat. The seller was very helpful with the exact measurements. Because it fits like a dream! So it was a very good investment. I did have to pay taxes at the post office, but that was to be expected. I would for sure buy again from this seller, she has some amazing pieces. I accept PayPal and major credit cards. You aren't required to have a PayPal account to purchase items via PayPal. Please contact me if you would like to pay via check or money order; I'll be glad to accommodate. No returns or exchanges. I describe my items to the best of my ability and carefully measure clothing. Please feel free to ask as many questions as you need to make an informed purchase. I will answer within 8 hours. I will be glad to provide additional photos or information. Please convo me if you are not satisfied with your purchase and I will make it right. I try to ship within 48 hours of cleared payment. I normally ship US orders via USPS priority which now includes delivery confirmation and insurance. I will combine shipping just convo me will the items you are interested in and I will get an exact shipping price for you. If the order is very heavy I will use USPS Retail Ground or Priority Flat Rate. I use First Class for International orders as long as the package is under 4 pounds. If the order weighs over 4 pounds, it will have to ship US Priority. Please let me know if you want me to add insurance cost to the price of your shipping if you are an international shopper. I strive reuse and recycle shipping and packaging materials when possible. US Shipping prices are estimated for coast to coast. I am on the east coast. Please convo me with your zip code and I will recalculate shipping for your area. Not responsible for international packages shipped via first class lost in the mail; please let me know if you want to add insurance or upgrade shipping. Buyer is responsible for any customs fees. I cannot change the value of the item on custom forms. Please feel free to ask me as many questions as necessary for you to make an informed satisfying purchase. Please allow yourself a few inches to move, i.e., if the bust size of an item is 36 inches and your bust is a 36, the item will be too tight for you. The best bet is to measure a garment that fits you well and compare the measurements. Please note all measurements provided and compare them to an item that fits you well. Feel free to ask me to provide more measurements on the garment. I will be glad to provide more photos of any item and answer all questions. Colors may vary between pictures on your monitor and real life. Items are measured laying flat. The size given is the closest to the modern US size. Feel free to ask me for additional measurements. Care instructions are provided according to the garment's care tag. If there is no care tag I will provide my recommendation. Can you ship my order outside of the United States? Sure can! If you don't see International Shipping options, just convo me your zip code/country code along with the item(s) you want shipped and I will get you an exact shipping quote for the fastest and cheapest method. item(s) you want shipped and I will get you an exact shipping quote for the fastest and cheapest method.